Cimavax-EGF is the first worldwide registered therapeutic vaccine for non-small lung cancer developed in Cuba by the Center for Molecular Immunology in conjunction with the Center for Genetic Engineering and Biotechnology. In 2008 it was approved by the Cuban regulatory authority for the use in adults with advanced stages of the cancer. The vaccine is based on active immunotherapy which is the process of using the body’s immune system to fight cancer. Lung cancer is one of the most common type of cancer with an approximate 1.59 million cases diagnosed in 2012 worldwide, and is by far one of the leading cause of cancer related deaths worldwide for both men and women. Though lung cancer is generally classified as an incurable cancer it is almost always treatable. It is important to clarify that there are very few cancers in which people can be proclaimed completely cancer free in that the risk of reoccurrence of any type of cancer is still present even years after initial diagnosis. However, the longer a patient lives without evidence of the cancer the less likely it would reoccur. Long-term survival with lung cancer is sometimes possible, especially when the disease is caught in the early stages. Some people survive many years even with stage 4 lung cancer. There are reported cases — though rare — in which lung cancer has spontaneously regressed. The last few decades saw a large number of researches on lung cancer, it’s prevention and treatment. Traditionally non-small cell cancer has been treated with surgery, chemotherapy, radiation or a combination of these. In the last few years however, special attention has been paid to research done on the treatment of cancer through immunotherapy (biologic therapy) in which the body’s immune system is stimulated to fight cancer. The idea behind immunotherapy is based on the understanding that cancer cells are frequently found in the body which are usually destroyed by the immune system and only become life threatening when the immune system cannot or does not destroy them. It is argued that chemotherapy and radiotherapy, though have proved to be highly successful in shrinking or destroying tumors, are highly toxic and do not distinguish between healthy cells and unhealthy ones. The aim of immunotherapy is not the shrinking of the tumor but the control of the cancer growth hence increasing patients’ life expectancy and improving quality of life. Cuba has long established itself as a leader in the area of health care and has become world renown in medicine and medical training. It’s scientists are well respected by foreign peers for the developments of such vaccines as meningitis B and hepatitis B. According to the World Health Organization, researchers in the Cuban Center for Molecular Immunology have made significant advancement in new cancer treatments with emphasis on transferring cancer from a deadly disease to a chronic one. 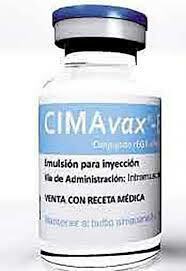 Cimavax-EGF is the result of a 25 years research program developed by the Center for Molecular Immunology and the Center for Genetic Engineering and Biotechnology in Cuba. It is the world’s first stage 3 and stage 4 non-small cell lung cancer vaccine and is usually administered after chemotherapy and radiotherapy has already been given. Cimavax-EGF works by targeting epidermal growth factor (EGF) which is a protein found naturally in the body. In a healthy body EGF gives signals to cells to grow and divide by attaching to the receptors on the cell’s surface. In certain types of cancers such as with non-small cell lung cancer, the body produces too much EGF forcing the cells to grow and divide uncontrollably. In order for cancer cells to grow to an extent as to be able to deceive the immune system it has to be able to overcome the immune response. For a vaccine to have any effect it must be able to produce an immune response that did not take place naturally. Cimavax-EGF stimulates the immune system to produce antibodies that are specifically targeted for EGF and bind with it. Since the EGF no longer attaches itself to the receptors on cancer cells, the signal to grow and divide is no longer received thus slowing down the uncontrolled growth of cancer cells. Cimavax-EGF does not prevent cancer from developing, rather it sets in motion a mechanism whereby the uncontrolled growth and division of cancer cells are more restrained transforming a late stage aggressive lung cancer into a chronic disease. Cimavax-EGF is well tolerated and has fewer side effects than the standard cancer treatment since it only targets malignant cells. This vaccine is in the trial process in the UK, Canada, China and Peru and is in the process of approval in Argentina, Brazil, Colombia and Paraguay. Cimavax-EGF is one of two non-small cell lung cancer to be developed in Cuba, Racotumomab is the second vaccine developed which became available in January, 2013.